Will a can of paint amount to thousands of dollars added to your sales price? It could. Because while you know your home is valuable, sometimes all it takes is a few little improvements to help potential buyers see it too. We’ve outlined the most popular upgrades below. Your agent can help prioritize each by determining which projects will add the most value based on your specific home, neighborhood, and market. Because knowing which home projects pay off is our job. Find An Agent. It’s enticing to try to put a ton of money into your home to get a higher price, but that rarely pays off. Recent home remodeling trends favor increased functionality and living space over luxury. A swimming pool or hot tub may not be as appealing to some buyers as a wooden deck or cozy home office. The important thing to remember is to make additions and remodels for your own enjoyment, and not neglect the little things when it comes to attracting buyers. Cleanliness and structural soundness, as well as extra touches like new hardware and a fresh coat of paint, are much less expensive and more effective. SPACE SELLS. IT’S AS SIMPLE AS THAT. If your home is ﬁlled with your own personal story, there isn’t room for anyone else’s. 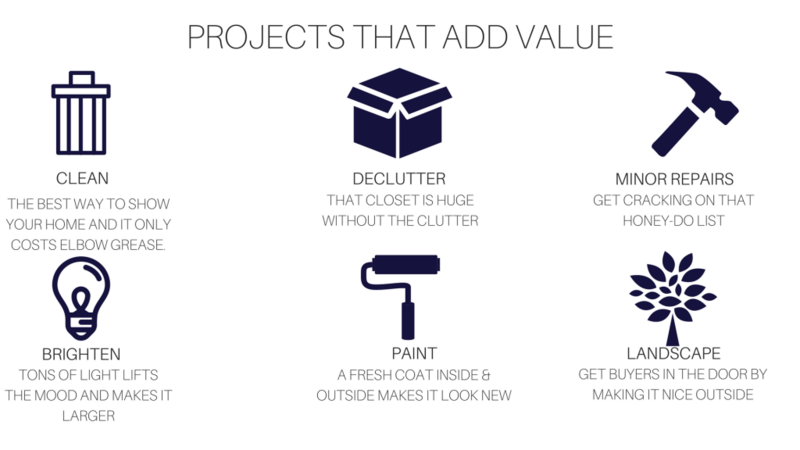 That­s why the biggest thing you can do to improve the marketability of your home is de-clutter, clean, and organize, all which have the beneﬁt of being basically free. Even with the expense of a storage unit or pod rental, its a small price to pay for a timely sale. When a buyer walks in, you want them to see important features like space, light, and ﬂow, which is hard to do if they are distracted by your life and the items in it. You are going to have to pack up things when you move anyway, so you might as well get a head start and throw away or donate anything you haven’t used in a year or don’t plan on bringing with you. We all amass a staggering amount of junk over the years, which can shrink your space. DE-CLUTTER. Get rid of the excess! Take as much as you can out of your home to make it seem as large as possible, removing anything that distracts buyers like photographs and heirlooms. Remove personal items and stick them in drawers or pack them up with other items meant for storage. Put daily essentials in a small box that can be stored when not in use. ORGANIZE. Your home will seem larger and more welcoming if everything is in it’s place. If you are short on time, focus on bathrooms and kitchens, which are the main focus of buyers. Make sure shelves and cabinets are neatly arrange. It seems like you have more storage when things are orderly, and storage is a huge selling point! Rearrange furniture so every room has a defined purpose. MAKE MINOR REPAIRS. Fix up the things on your honey do list! Consider painting neutral colors. Don’t give buyers a reason to remember your house for it’s interesting paint choices. Replace all burned out lightbulbs. MAKE THE HOUSE SPARKLE. The most effective way of showing off your home in it’s best light is to clean it from top to bottom, and it only costs some elbow grease. Does it look like no one lives there? You are on the right track. CHECK CURB APPEAL. Buyers will never walk through the door if they don’t like the way the outside looks. Go stand in front of your house and imagine how it looks to potential buyers.